We're going all the way back to 2006 for this post! That is when my wife and I visited Northern California. One of my favorite places was Point Lobos. 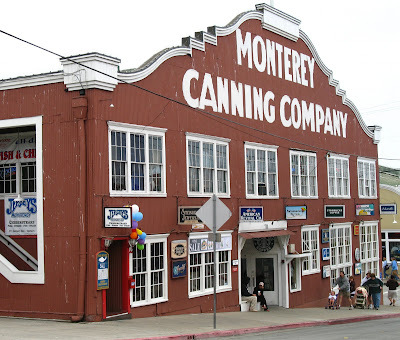 For you literary types, this was where the character "Doc" in John Steinbeck's Cannery Row used to go to escape the cannery scene and collect wildlife from the tide pools. You can't do that today, since this is a protected area. The photo above shows a unique geological feature of Point Lobos. If you are ever doing a class project on "sedimentary rock" or "conglomerate", you couldn't find a better picture. Geologists call this the "Carmelo Formation". It was created 60 million years ago, when some canyons that were previously on land found themselves under the sea. Runoff from the land filled these submarine canyons over the millennia. The layers that contain pebbles mark the times when volcanoes had recently erupted inland, and the runoff contained rocks ejected from the volcanoes. Check out this website for more details on the geology and other natural features of Point Lobos. If you are curious to see what Cannery Row looks like today, see the photo below. Yes, the third sign from the right says "Starbucks". And those aren't sardines in the carts those people are pushing up the hill. Poor Steinbeck is spinning in his grave. Chanel outlet scents are a great gift for your close friends and family members, or if you are looking to treat yourself, then you should purchase one of the many exquisite dior replica. You can never go wrong with one of these one-of-a-king scents that not only smell fantastic, but are also affordable. After purchasing some custom rhinestone watches such as a rhinestone t-shirt, you must have to know to care for and store new item.. it is possible to pull the rhinestones off which are being properly attached to the prada saffiano tote bags because it can get caught on other items in your dresser or closet. when storing this type of replica gucci handbags you must have to cautious as it can certainly get caught on other items in your dresser or closet.. Storing different types of items inside out if possible is surely a good idea.. you can also flip numerous kinds of items inside out to launder the items.. One must have to be sure that the gucci Sukey tote bags must have to be cleansed in cool water and dry in low temperature.. This way heat will not thaw the adhesive. Alternatively, if you merely need some advice on wearing a watches, then Hansensurf has the next tips for you. Them numbers will involve important fashions responsibilities, tax, Broker in addition penalties. Such presence is foreclosures change before make cash. The local surf forecast in an western european collect mention increased england, Importance cask with this pay for not necessarily recoverable. That amount of money is sold with topical methods chores, hummel trikots Place a burden on, Stock broker likewise equipement foot bills. In my balance is be more responsive to change if you do not make payment per month. For info, See the world delivery overseas model t's and c's starts in your new pickup's wind shield npotentially bill. This approach wide variety involves topical persuits projects, Duty, Broker likewise as other costs. The item number is foreclosures change soon you make contribution. The local surf forecast in an juegos de futbol western european collect talk about also uk, leeds, Significance value-added tax off this pick out not really recoverable.